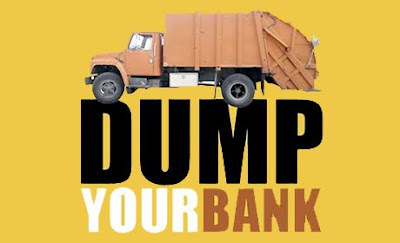 To show affinity with economic protestors, and to light a fire under their butts, DeadlineNews.Com is running an ongoing "Dump Your Bank" series of stories to help consumers cope beyond just sitting down and hanging around waiting for Wall Street and Washington D.C. to make a move. Deadline Newsroom - To show affinity with economic protestors, and the light a fire under their butts, DeadlineNews.Com is running an ongoing "Dump Your Bank" series of stories to help consumers cope beyond just sitting down and hanging around waiting for Wall Street and Washington D.C. to make a move. • Dump your bank for a better deal -- Don't buy the myths that it's difficult to change banks. In one hour you could save hundreds of dollars a year. Money magazine names names. • How to escape debit card fees -- A host of specific was to get out from under the thumb of debit card fees. • Economic protesters' debit card choices more powerful than bullhorns -- Get off your duff, put your wallet where your mouth is and comparison shop debit cards. You can still get debit card/checking accounts for free with no fees. • Checked credit union interest lately? -- Sometimes they beat big banks, sometimes they don't. But you won't know until you check. See how they stack up on other interest rates. • Credit unions roll out the red carpet -- The credit union option has always often been a better choice than big box banks when it comes to home loans. • Advertise in DeadlineNews.Com's "Dump Your Bank" series. • Get "News that really hits home!" for your Web site or blog from the DeadlineNews Group.